I have been using this recipe for ages. 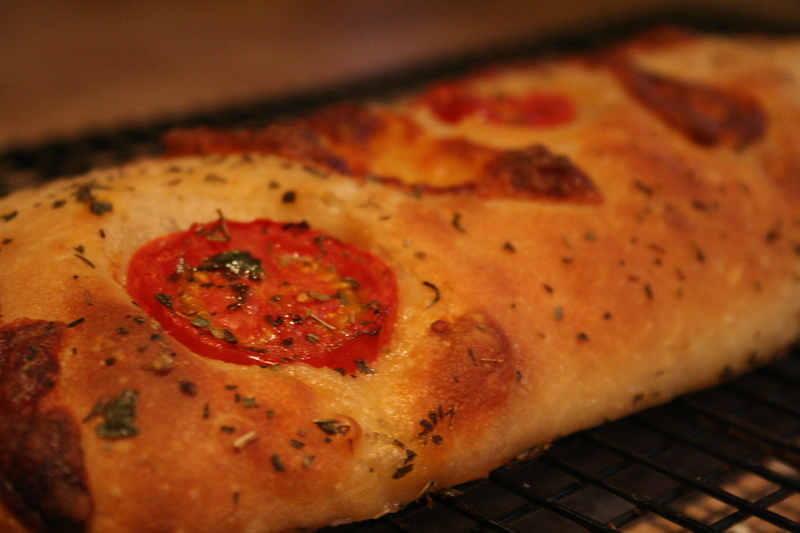 My kids have referred to it over the years as Your Focaccia. I am pretty sure there was an actual recipe that I followed at some point but I honestly don’t know which one. I often make this when I know I have either the whole family home or friends coming over. 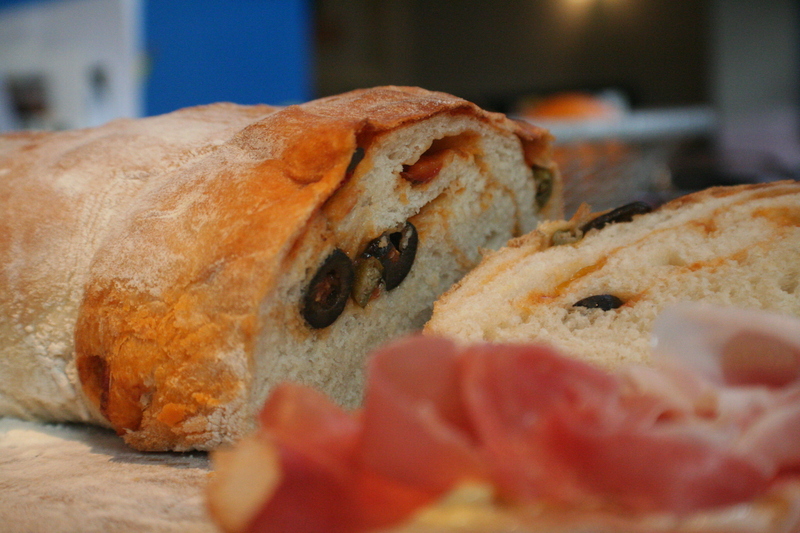 It’s an easy to make bread (I think) that I happily serve with olives, antipasti and olive oil with a smidge of balsamic. It also magically turns into burger buns when cut into squares. The other week we had it with roast chicken that had been marinated in honey and turmeric 🙂 The only thing I would suggest is a must is a good solid food mixer. You can of course knead by hand but the mixture is pretty wet so the mixer makes light work of this hard sticky job. a good drizzle or 4 of olive oil. I prefer the light one but your choice. Rapeseed oil is good here too although I am sure not correct for a focaccia. dried herbs – rosemary is traditional but I often use whatever is to hand. In your mixer bowl. Put in your water first and then your dry ingredients. Make sure your salt is away from the yeast. Or even mix the salt in with the water first. Set your mixer with the dough hook to the lowest speed and mix for 10-13 minutes or so. As it is mixing drizzle in a good slug of olive oil. This is easier if you do this fairly early on in the process. You want a lovely smooth dough that’s nice and stretchy. Leave your gorgeous dough to rise for an hour or so till doubled in size. This can take longer, worry not. Keep it cozy and draught free and that will help. Flour the tray you will bake it on and pop your risen dough on top and gently push it out to a sort of rectangle shape. Leave to prove again for about half an hour whilst your oven heats up to whatever the top setting is. Your lovely dough needs a couple of finishing touches before you stick her in the oven. 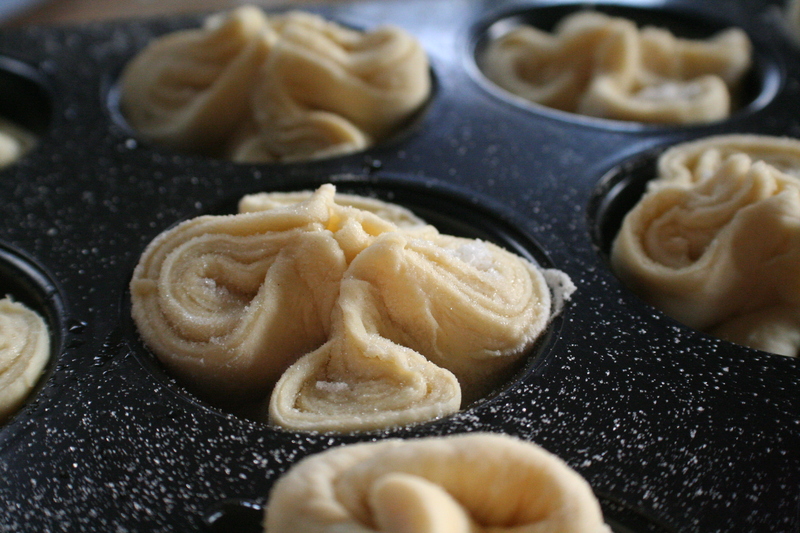 First give your dough lots of deep dimples with your fingers and then drizzle over some more olive oil. Sprinkle your salt and herbs and then pop in your piping hot oven. Cook at this high temp for the first ten minutes only and then turn your oven down to between 180 and 200 depending on how feisty and fan assisted your oven is. Then cook her for about another 20 minutes. Again you will need to watch and see how fast your oven is. What you want is a loaf that looks golden, smells fab and makes a hole sounds when tapped on the bottom. Cool on a wire rack for as long as the family will allow, although it does slice more easily if it is cool. One of our favourite recipes for a weekday yummy dinner that can be made in merest moments is Pasta Puttanesca. It is a great, cheap and tasty dish that I of course must thank Nigella for introducing me to. The basic recipe makes a delicious sauce that you add to your pasta of choice (tagliatelle is our fave for this) and top if you like with a little parmesan and serve with crunchy garlic bread or french bread. Om nom nom. 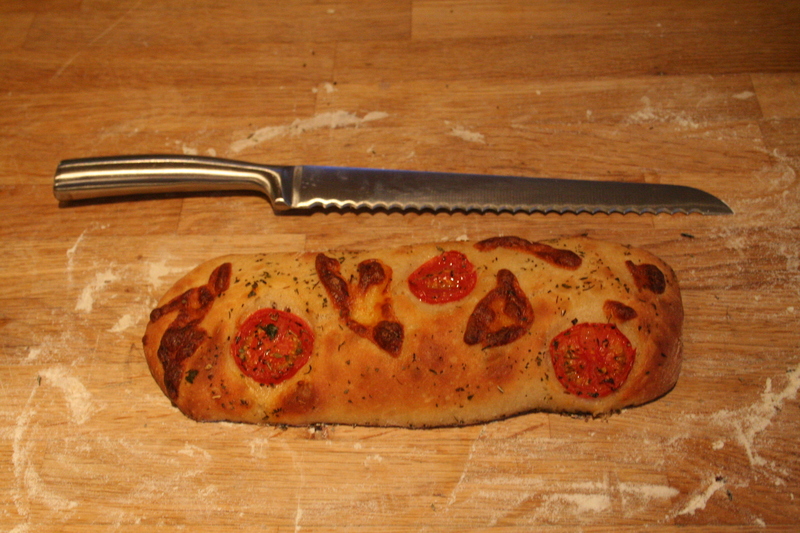 Well looking for inspiration for my bread recipe the other day I wondered what would happen if I took the puttenesca sauce and added it to a bread. I thought the result was pretty tasty. I think the trick to making a filled flavoured bread is to really ramp up the flavour. Next time I think I will add extra of pretty much everything as although the flavour was good it wasn’t nearly punchy enough. Heat up your oil in a frying pan and add your anchovies, lowish heat and sort of melt them. I know that sounds odd but trust me, gently sizzle them and they will kind of melt down. Chuck in your chopped tomatoes and bring that up to a simmer. 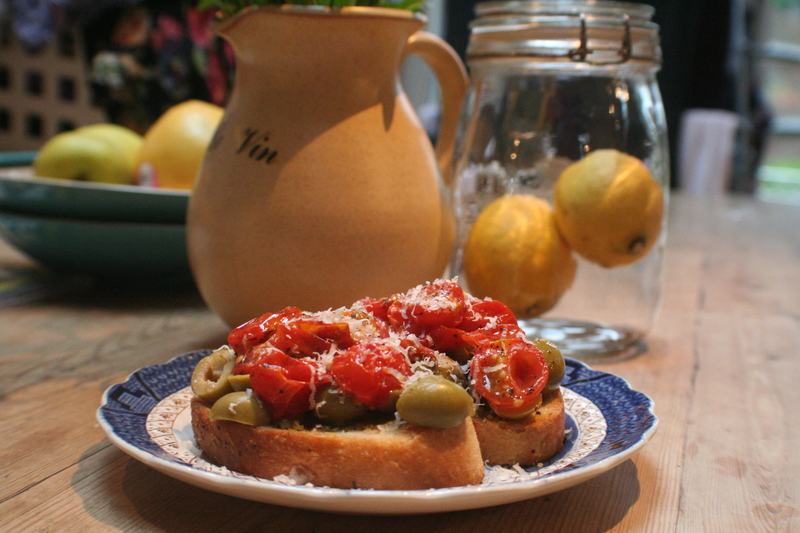 Add your olives and capers, again you can add more or less to your taste. None of my kids like the capers at all but the sauce really misses them if you leave them out. It’s just not quite right without. All of my offspring happily eat round the capers. I’m sure one day they’ll eat them by mistake, ha ha. Anyway, let this sauce gently bubble for around ten minutes. This is the perfect amount of time to cook your pasta and some garlic bread if you like. Once it had done it’s first prove, I gently flattened it out on my floured work surface. On this I spread my cooled puttanesca sauce. Then I rolled it up, swiss roll style, popped it in an oiled roasting pan. You can use whatever you have that’s large enough for the bread. Mine was a fair size! Leave it to one side to have a second proving for an hour or so. Once the oven is hot and your bread is ready, pop it in the oven. Bake at this high temperature for ten minutes or so and then lower temperature to 200 degrees c and bake for another 20 minutes or so. You will need to adjust this according to how feisty your oven is and whether it is fan assisted. Well, decided to get back to blogging. Safe to say I am not very regular with my posts. In my head I am much more efficient. If I’m honest this may be the one and only post for a while again or I’ll have a little flurry of baking, crochet and writing activity. Who knows, part of the fun and mystery that is me!!! 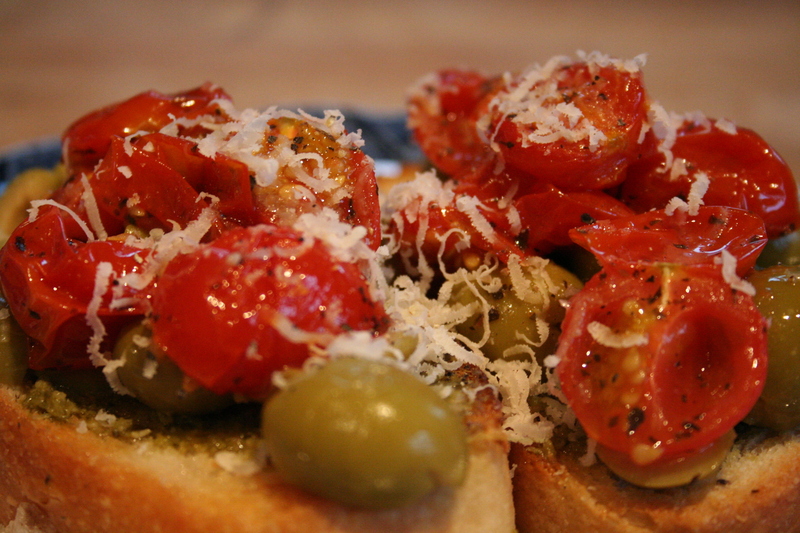 Well as mentioned in the title of this blog, my favourite thing to eat at the moment is bruschetta with green olives, pesto and slow roasted baby tomatoes. I make the bread myself (of course). 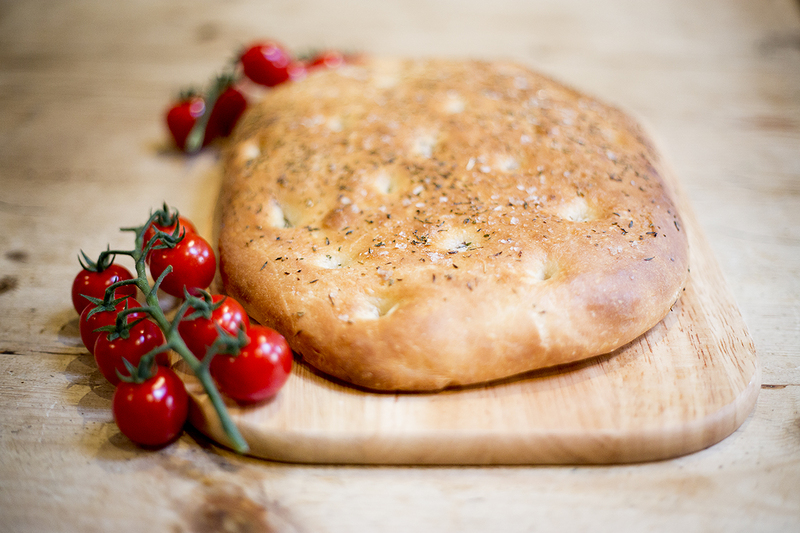 The best bread for this is a simple white bread, but a foccacia style or even a ciabatta work really well too. The good thing is that because you are toasting your bread it really doesn’t matter if it is a day old and on the sturdy side. This is a great way to use up that third of a loaf that I often have left over, especially now the kids seem to have suddenly grown up and left. Basil pesto, I’m sure you could make this yourself but life is too short to faff. 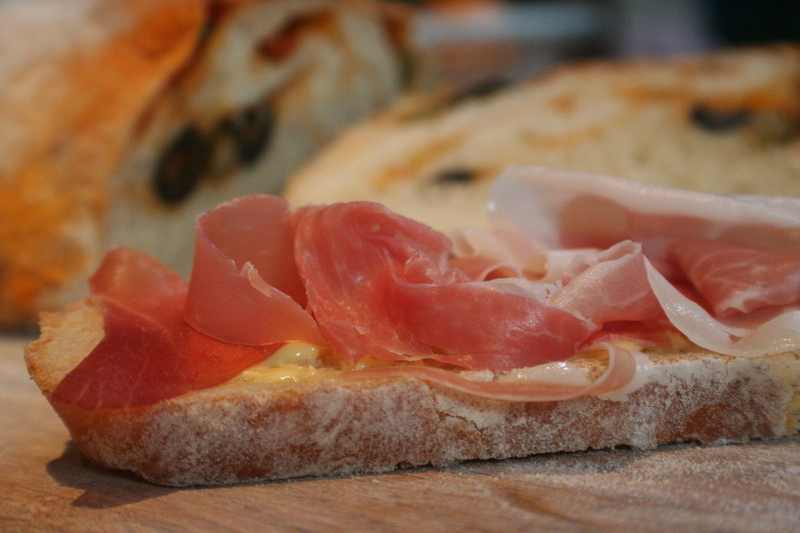 Sometimes you just want to eat something yummy now and if you made the bread you have done more than enough. Jar of green olives, about half the jar will serve 2-3 of you. Rough chop these. In an ovenproof dish place your halved tomatoes. Pop your tomatoes in the oven and then turn the oven right down to 140 – 160 degrees c and bake for around 20 – 30 minutes or so till they are just starting to go a bit droopy and luscious looking. You’ll need to adjust a bit to suit depending on the feistiness of your oven. Mine has a tendency to nuke things especially if I’m multi tasking. 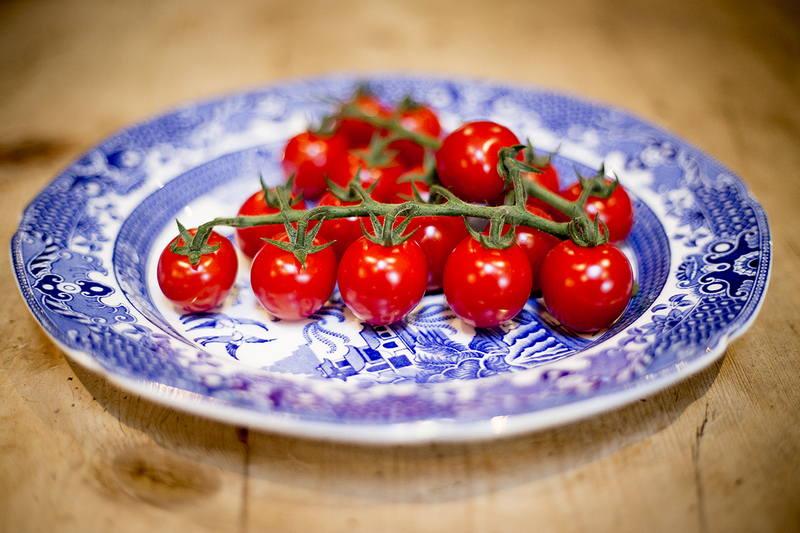 Nigella does do a fabulous version of her moon blush tomatoes where these are left in the oven overnight. Whilst I have made it her way many times, I am rarely prepared enough to know what I want to eat the day before! Well, for goodness sake. How rubbish at this blogging lark am I. 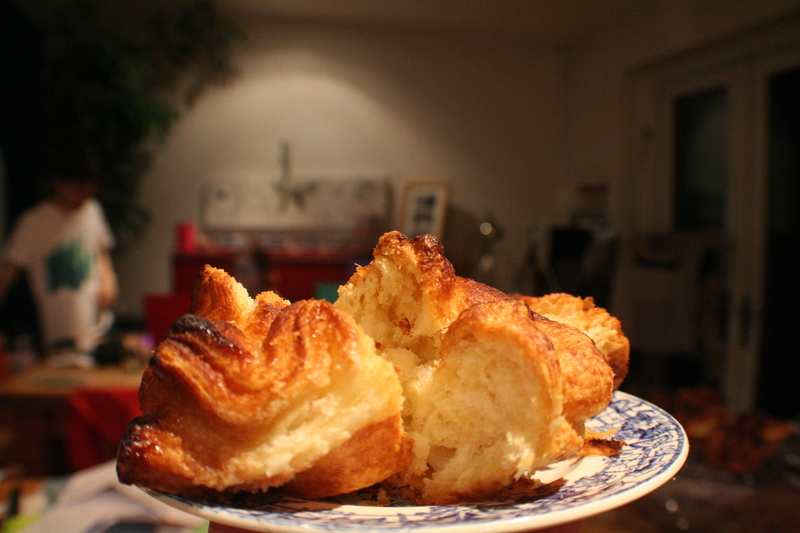 The plan was to bake and blog at least once a week, I think I am managing once a quarter. Hmmmmm, must do better. Hopefully it was worth the wait. Actually one of the reasons I have been slow to bake and blog is I have developed a bit of a passion for all things crochet. 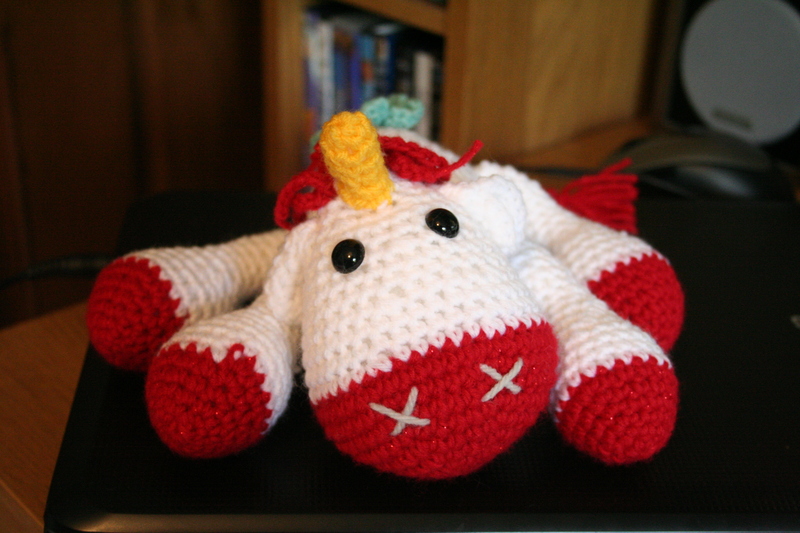 Thanks to a very dear friend who showed me how to hold the hook and youtube I am now able to conjure up blankets, baby shoes and as of this week a unicorn, an octopus and a baby owl!! 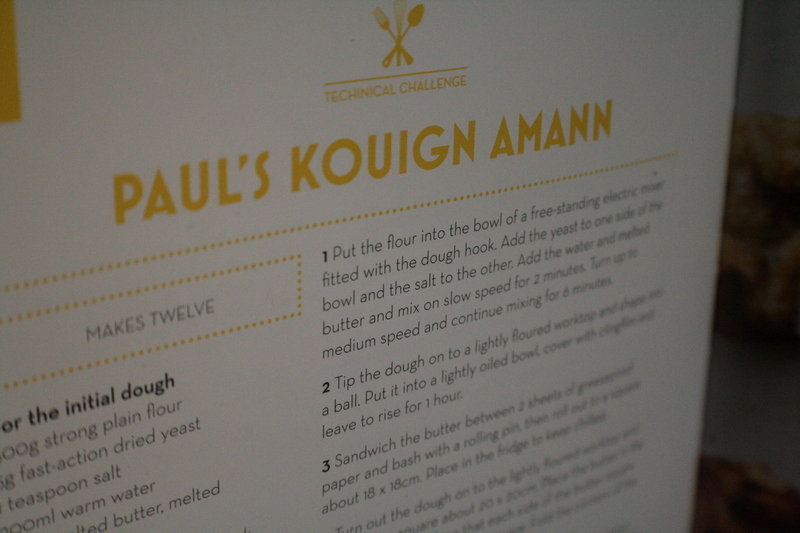 Right, now to get on with the recipe that I teased you all with in the title. Paul Holywood’s How to bake book has many yummy treats but one that I spotted recently looked especially appealing. 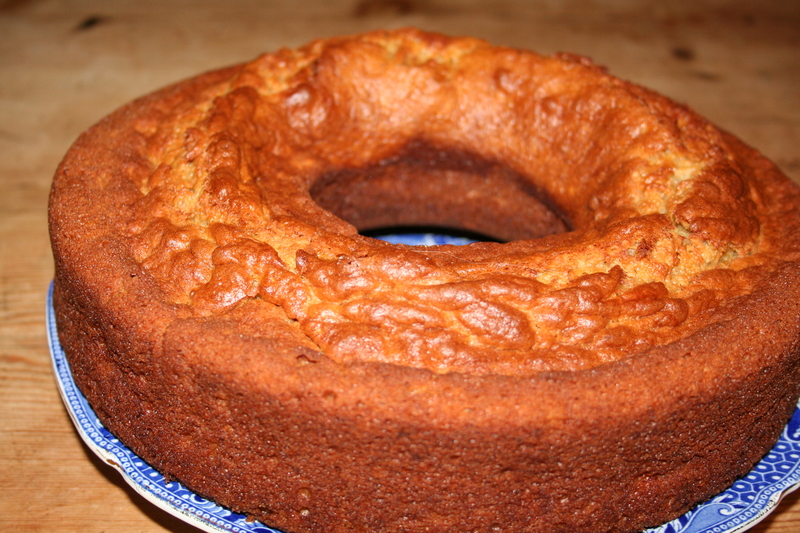 The recipe makes two reasonable sized loaves and to our delight also lasted really well. So often with homemade bread you only have a day or so before it goes stale. This bread lasted beautifully for a couple of days and in fact we were still eating it happily on day three and four (it was a little sturdy by then but still very much in the yummy category). If you have a food mixer I would use it. This recipe would be tedious if done completely by hand although not impossible if you are feeling full of energy and not afraid of getting a bit sticky. In your bowl of the mixer, place your flour and put your salt on one side and the yeast in the other. Add the butter, sugar, eggs, milk and half the water and mix on slow speed using the dough hook. Once the dough starts coming together you can slowly add the rest of the water. Mix on medium speed for 5 minutes. Your dough should be elastic and soft to touch. If not mix it for another two minutes. Add your dried fruit and cinnamon and then mix for a further 2 minutes. I mixed mine for around ten minutes in total in the end to get that dough really elastic and soft. Cover your bowl with a bit of cling film or your handy shower cap (you can pick these up on eBay for a quid or so for ten) Leave to rise for at least an hour probably two though. It wants to be at least double original size. Once your dough is all awesome and huge, tip it out on to your floured surface and gently knock it back by folding it over a few times. Divide into two pieces. Shape each piece into a loaf shape and pop it onto it’s tray. Put these trays into plastic bags and leave them to prove again for an hour so they can double in size. Preheat your oven to 210 degrees C.
When your dough has proved itself, pop in the oven for 20 minutes or until the loaves sound hollow when tapped on their bottoms. My oven is a bit aggressive so I find I need to turn it down to 190. Leave it on a wire rack to cool. Once your bread has cooled a bit but still warm you can top with the icing, simply mix your icing sugar, zest and water together to a smooth batter and then brush this over the warm loaves. Leave to cool. 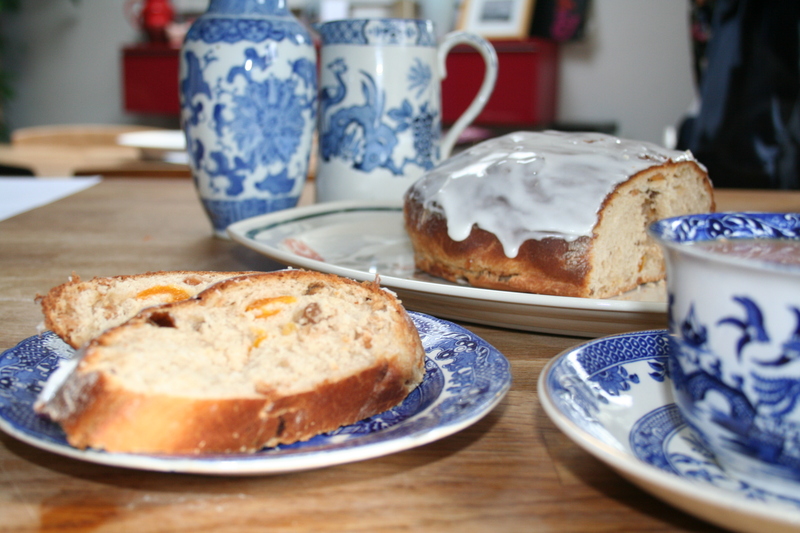 Slice and eat with a lovely cup of tea. I stored these loaves in a large tupperware box happily for several days. I would think if you choose not to ice both, the second plain one would make gorgeous toast for a delicious breakfast. My daughter and I were reading cook books yesterday, as you do. We wanted something yummy to have with our afternoon tea. When she comes home from college I have usually finished my work for the day, so we have got into the delightful habit of having a cup of tea, biscuit/cake type thing. She then watches “Come Dine with Me” whilst I dabble with a bit of crochet (my latest creative love, so very, very addictive that I have been known to leave it almost too late to pick up the husband from the station!). Anyway, when my daughter found the page for Chelsea buns she got very excited which, as we all know is a challenge for the average teenager. So with her help we gathered the ingredients together to make these buns. As they are a bread type thing they do take a while. Luckily for the youngest and myself I had other emergency biscuits in the house to tide us over whilst these were doing their thing. They did, in fact take hours, as my house was on the chilly side yesterday which really slowed the proving time down 😦 I am sure Mr Hollywood would also suggest that because it is an enriched dough that would also cause it to take longer to prove. Not an expert here at all so I suspect a bit of trial and error on these is required. I found the mixture was quite dry and next time I make these I may add a smidge more liquid, not too much though as the end result tasted pretty good. 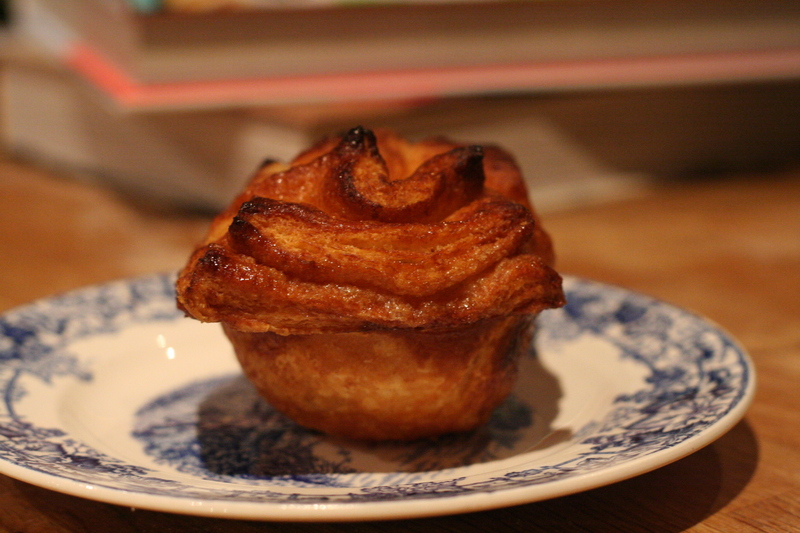 The recipe for these came from the The Great British Book of Baking. Gently warm your milk and butter together (from the dough list). Cool it slightly so it is lukewarm (pop your finger in, if you can’t feel it then it is perfect). Beat your egg into this mixture. In your mixing bowl (I used my electric mixer but you can do this by hand) put in all your dough dry ingredients and then tip in your milky eggy buttery mix. Mix together either slowly in the mixer or by hand until your dough is a soft consistency. The recommendation in the book is to knead by hand for 10 minutes or slow setting in the machine for 4. I kneaded for 10 in the mixer in the end as the dough looked too stiff. I can’t say whether this is the correct way, but for me the dough looked better for it. Leave for at least an hour to double in size. Mine took nearly two to do it’s thing. Knock your dough back and then tip onto your work surface that you have already floured in anticipation of this moment. Cut it into two and roll each piece out into rectangles that measure around 38x13cm. As you can imagine from my hung ho approach to baking, I did not measure it but just rolled them out till they looked about the same! From the filling list, brush your melted butter over each rectangle, sprinkle over the muscovado and fruit and then roll up like a swiss roll. Roll from the long side. Cut each roll into 8 and then arrange them in your tin quite close together and then cover and leave for 40 minutes or so to prove again. While they are baking you can prepare your glaze. Put all your glaze ingredients into a small pan and gently warm together. Do not boil. When your buns are golden 🙂 take them out of the oven and brush on your glaze and then return to the oven for a final 5 minutes. When you take these out of the oven, leave them in the tin for around 10 minutes to cool slightly before you remove them completely to a wire rack to finish cooling. We found this recipe was really, really sweet and next time I make these I would reduce the muscovado probably by half. I am also going to add some cinnamon and other spices next time too. I suspect that will be delicious, so could possible reduce the sugars even further. The picture in the book also shows these with caster sugar sprinkled over the top! I would suggest that you don’t. Try them first, add if you need. Have fun playing around with the recipe, I would love to hear any thoughts on other versions of these. Really yummy, flatbreads with tomatoes and mozzarella. Perfect for a big family Saturday evening supper. Firstly I should acknowledge Paul Hollywood. 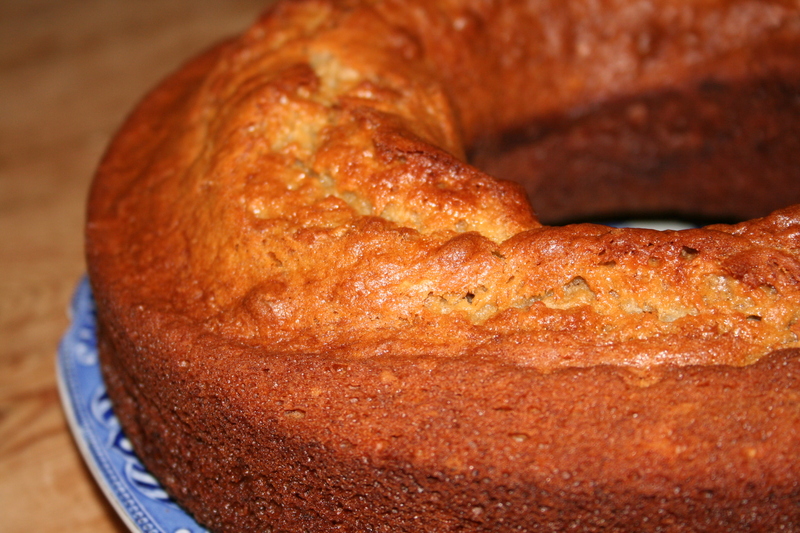 This recipe was gleaned from his book, How to Bake. When I was leafing through his book I saw the picture of these breads and thought immediately how much my pizza loving brood would enjoy these. I also felt they were a tad healthier than pizzas. When I made these we had them with salads, cold meats and cheeses. 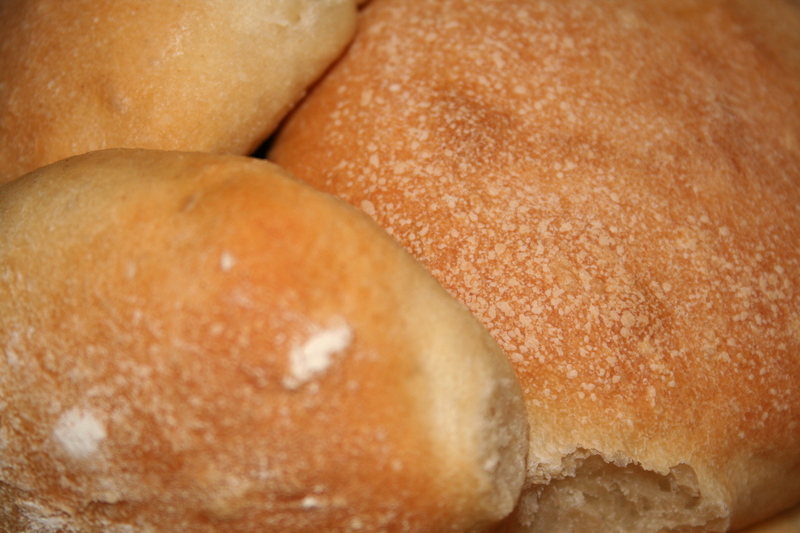 They are a great tear and share bread. The bread is best served fresh and warm from the oven but I did keep one for the next day and it refreshed beautifully in the oven. I sprinkled a little water on it and blasted it in a hot oven (200 c) for around 5-7 minutes. Generally though if you have a family of teens and young adults as I do the 4 loaves that this recipe makes will be eaten in one sitting, no problem :). You will need around 2 hours to have these breads ready for dinner. Fine semolina for dusting if you have it, optional. Oil a 2-3 litre square plastic container.That is what Paul say’s however I do not own a square plastic container so used the large plastic mixing bowl that I have instead. I believe this worked fine. Use whatever you have in your kitchen, the container is used to prove your bread. 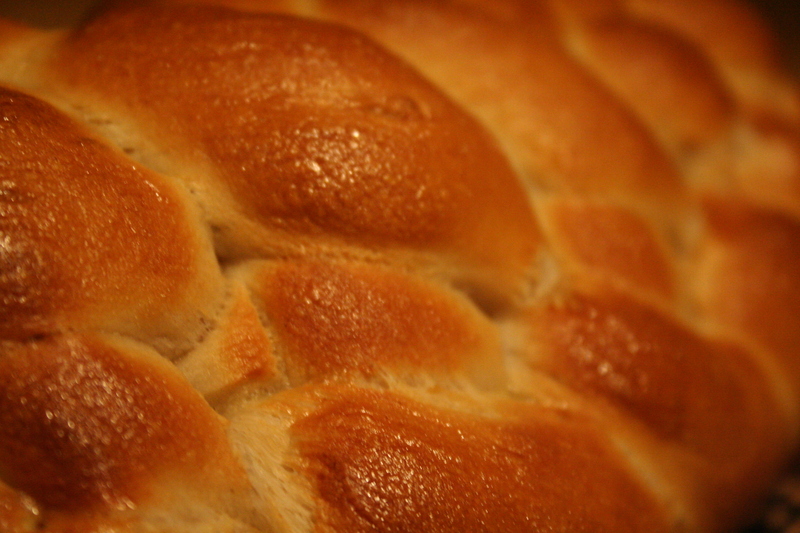 In a food mixer with the dough hook is the best way to make this bread. It is too wet to mix by hand. However if you are feeling adventurous, give it a go. I would love to hear from someone who has made this by hand and how well it worked. Put your flour in your mixing bowl with the salt on one side and the yeast on the other side. Add around three quarters of the water and start to mix the dough on a low speed. As it starts to come together add the remaining water. Mix for around 5-8 minutes on a medium speed. 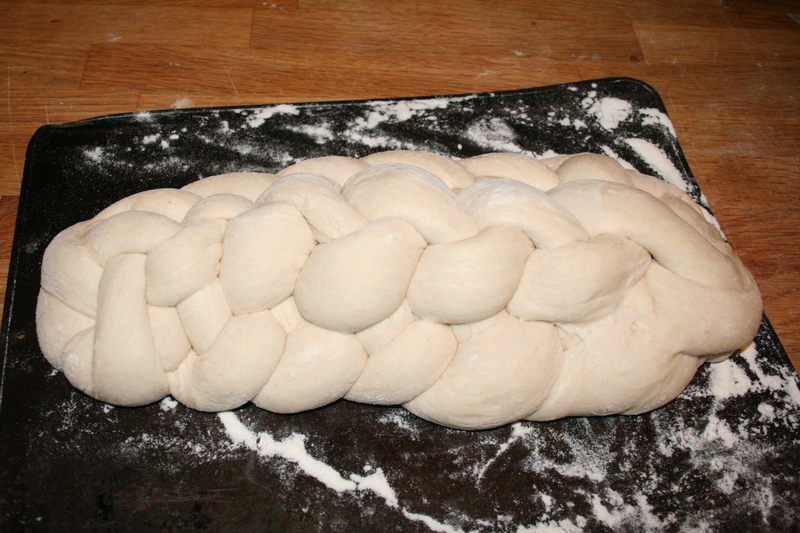 At this stage your dough should be nice and stretchy. Now add your olive oil and mix for another 2 minutes. Pop your dough into your oiled tub and cover with whatever you have to hand. I always use a trusty shower cap but cling film, a damp tea towel work well. I have also used a “bag for life” when I had nothing else and that worked too! Leave it to prove itself for about an hour. You want the dough to double in size. Put it in a warm place out of draughts. Line a couple of baking trays with baking parchment. 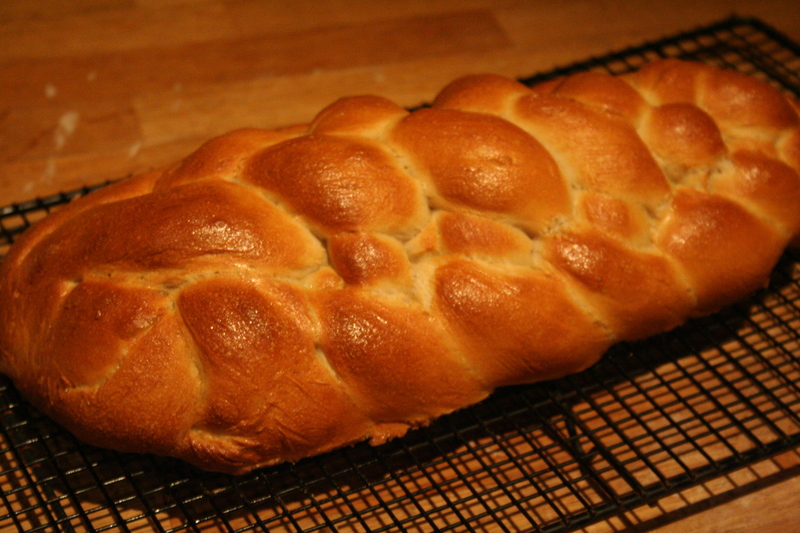 When I made this bread last time I had run out of baking paper so just lightly oiled the sheets and that worked fine. Dust your work surface generously with flour, adding semolina too if you have it. Gently tip out your dough onto the floured surface, unusually for dough you don’t want to knock it back but keep as much air in as possible. Coat the top of your dough with flour too. Cut the dough in half lengthways and then cut each half across in two. You will have 4 pieces of dough. Gently stretch each piece a little bit and lay down onto your prepared sheets. 2 loaves per sheet. Push 10 tomato halves into the breads. As you can see from my pictures I did not have enough tomatoes, worry not, use what you have! 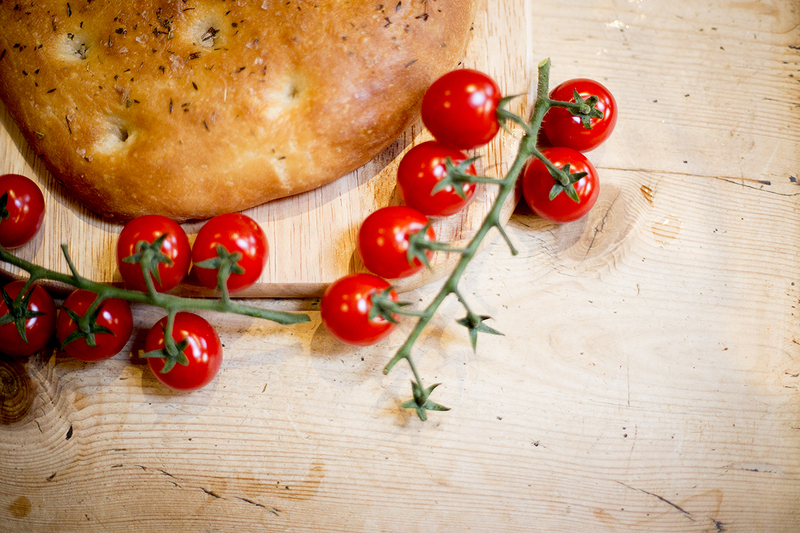 Tear your mozzarella into smallish pieces and push them into the bread in-between the tomatoes. Sprinkle your breads with a little olive oil and then your oregano. I used some garlic infused olive oil for extra yumminess and mixed italian herbs. Noms. Leave your bread to rest for around 15 minutes. Meanwhile pop your oven on to 210 degrees C.
Pop them onto a cooling rack but make sure to eat them whilst still warm.